The name Yasushi Igarashi should be familiar to most of you who read this magazine regularly. He’s the owner of Craps Inc., a car builder, and has worked on quite a few feature cars including the center car “Viejo 4.” Igarashi, as his friends call him, is a member of SouthSide Car Club and his commitment to excellence is a reflection of his heritage and affiliation with SouthSide. Born and raised in Japan, Igarashi saw his share of American iron and his fascination with the cars and the status that they brought was intoxicating. His dream was always to own one, cruising down the street, windows open, tunes blasting and enjoying all of the accolades from passers-by that come with owning a unique vehicle like this. “Aqua Boogie” is the fruits of three years of labor and the result is one that will have you drowning in details. 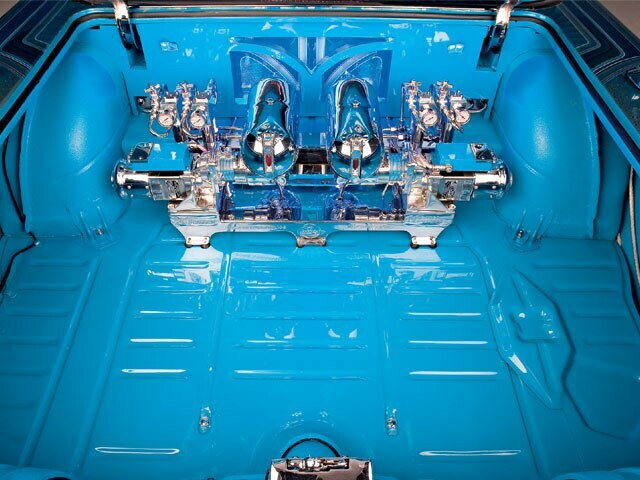 Check out the engine compartment for instance. You’ll notice there aren’t any wires to speak of and that’s because they were carefully routed out of eyesight. 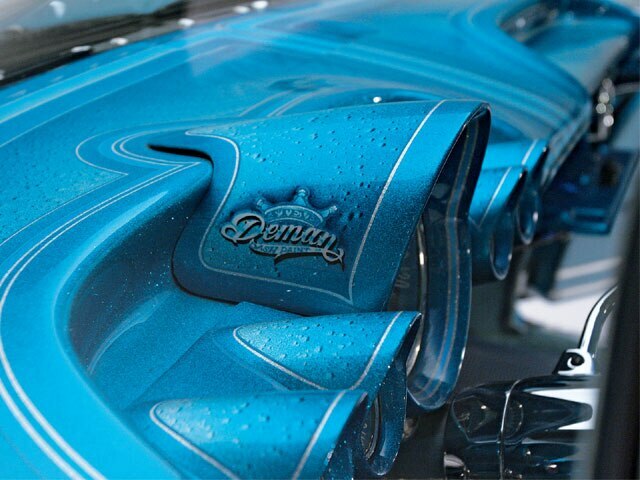 Everything on the car flows like water; each thing complementing the next. The right balance of accessories and their placement is crucial. There’s a finely tuned dance between gaudy and perfection that Igarashi has mastered. Take for instance the custom LED third brake light that resides on the rear of the roof. You would think that it’s an OEM piece the way that it flows with the car. 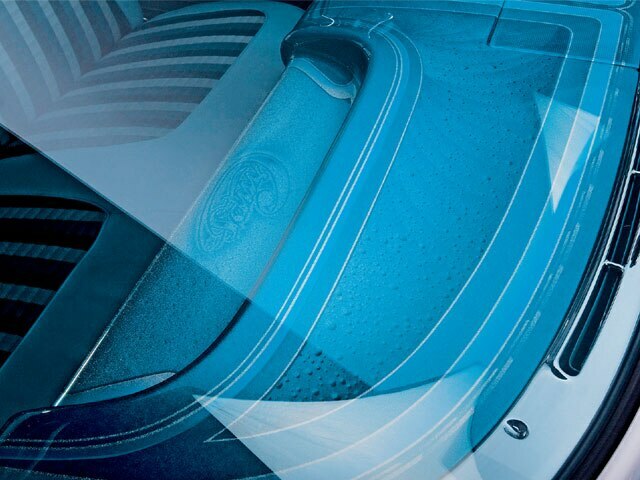 Or small touches like the shortened trunk molding in the center of the trunk that normally goes from front to back. This one change gives the patterns room to dance their dance uninterrupted on the trunk. 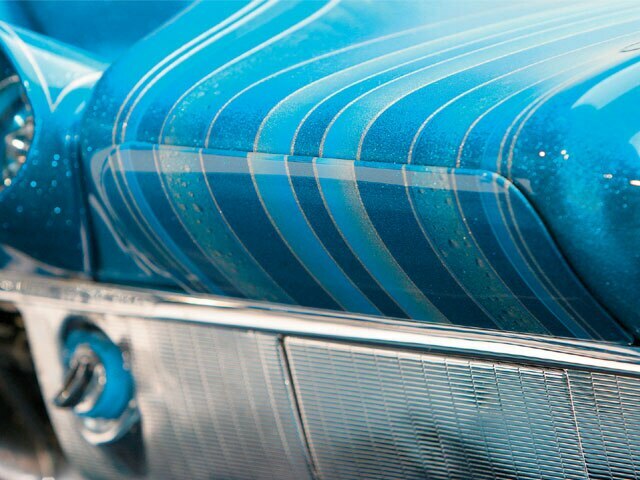 The paint has all of the moves of a skilled break-dancer in water from the patterns that flow from the top of the car like a backspin to the tail of the car like a windmill. Full of details, from water droplets to meteor streaks to centipede like swirls that end in Impala symbols, it’s all here. 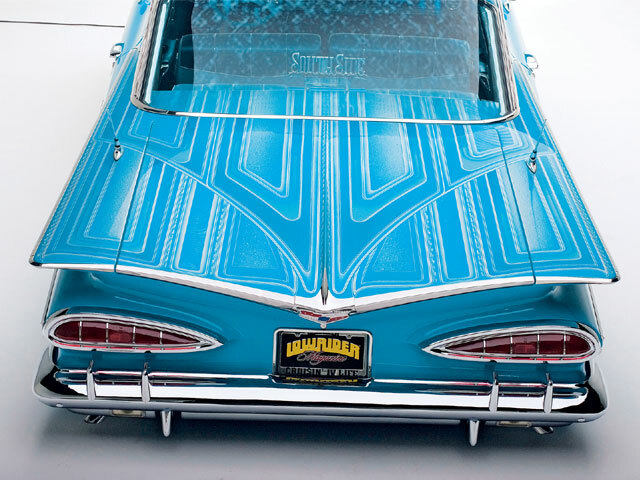 Visually, this car’s a ballet of patterns, colors and textures; you get an eyeful. The trunk sits with its understated simplicity, yet on close inspection you realize that this trunk has a lot of hidden gems. Take for instance the pump rack. At first glance it seems quite simple, but on further inspection, you realize that it’s engraved with the car’s name and the Craps logo among other things. In addition to being a billet piece, the rack is rubber mounted and supports a total OG setup. 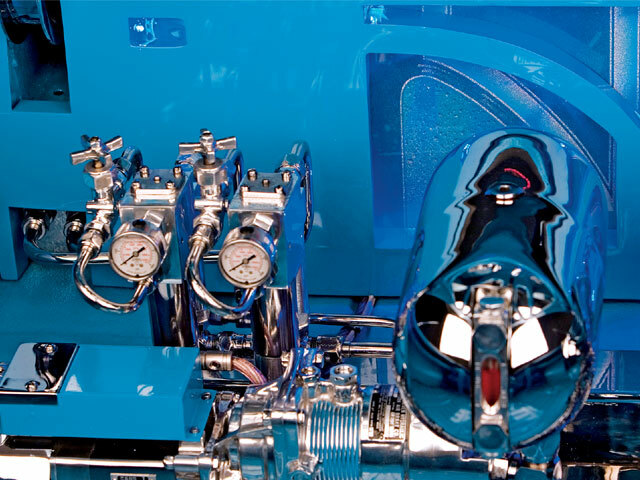 Adex, Eemco and Optima are the main dancers, along with liquid-filled gauges all polished and chromed to perfection. The interior is filled with power-power seats, windows, mirrors and vents windows, along with a chrome tilt steering column and smaller than stock steering wheel. 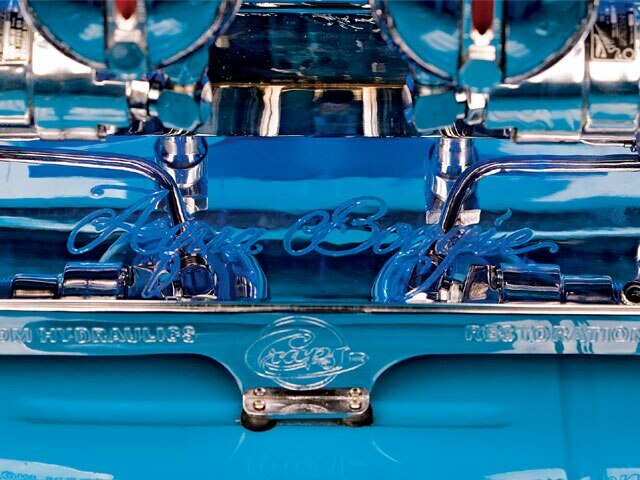 In the end, Aqua Boogie represents a well-choreographed dance of the past, present and future of lowriding. Igarashi heard the music in his head and danced to his own beat, something that we can all learn from. 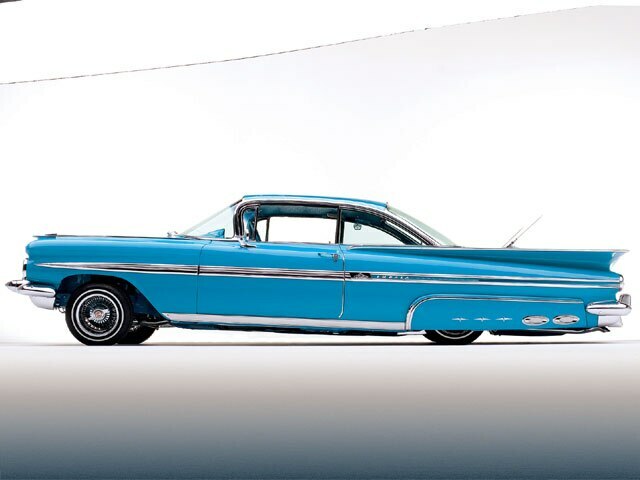 Aqua BoogieOwner: Yasushi IgarashiVehicle: ’59 Chevrolet ImpalaCity/State: Whittier, CaliforniaClub: SouthSide C.C. Engine/Drivetrain: A 1990 Chevy Corvette 350-c.i.d. 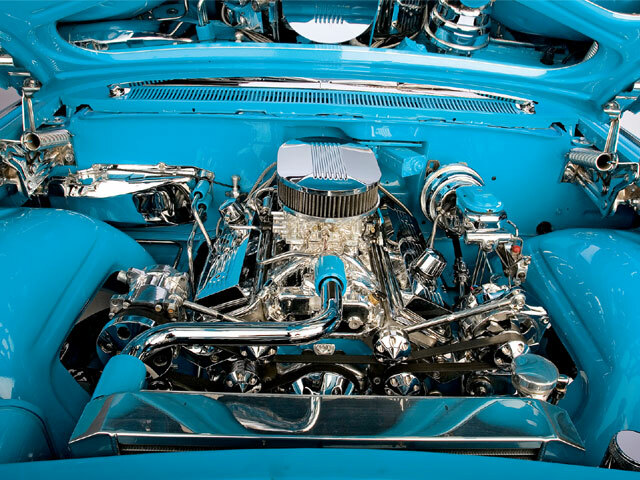 engine with a Street & Performance pulley system was mated to a polished Turbo 350 transmission and stainless steel Flowmaster exhaust by Craps Inc. in Whittier. Body/Paint: The bodywork was performed by Peet at Peet’s Body Shop in Whittier. A House of Kolor candy and pearl teal paint job was sprayed with graphics laid down by Steve Deman at Color Kings in Ontario, California. Anjero took care of the pinstriping. 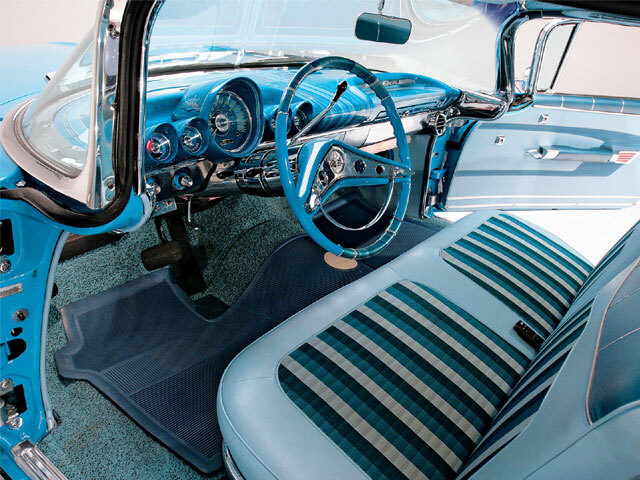 Interior: Featuring a 1958-style back seat covered in an OG pattern throughout, the interior work was performed by Bowtie Connection in Artesia, California. 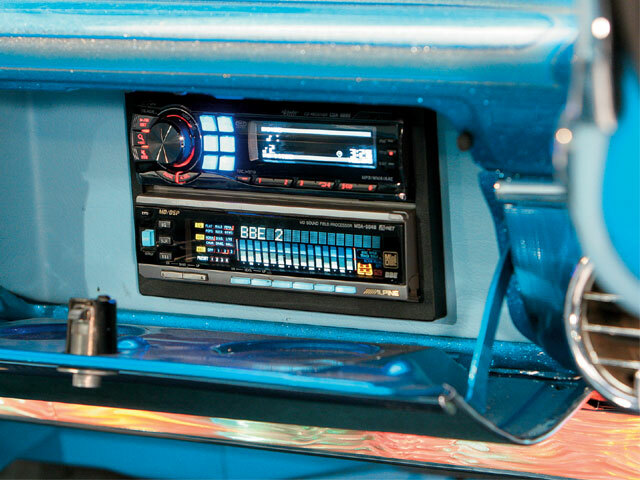 Sound System: An Alpine head unit, Rockford Fosgate amps, Kicker subwoofers and custom 42-inch color bar under the dash were all installed by 562 Kustoms in Paramount, California. Setup: Homies Hydraulics in Paramount fully wrapped and smoothed the frame. Craps Inc. of Whittier used Eemco pumps and Adex dumps with 6-inch (front) and 12-inch (rear) cylinders. 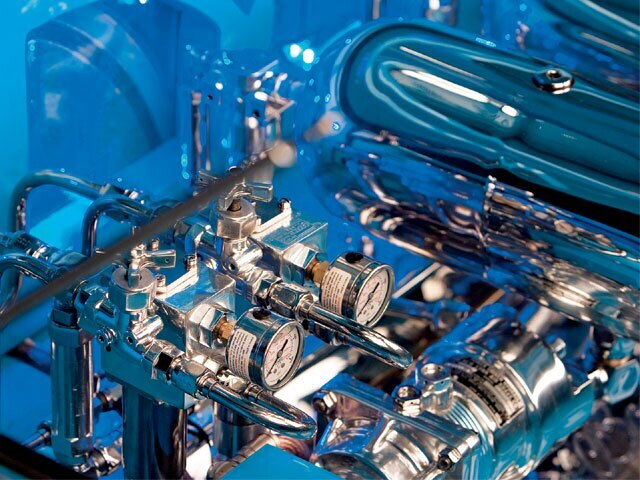 Four Optima blue batteries power the setup. The suspension features chrome-plated components, sway bar and four-wheel disc brakes.